1. Promotion Announcement. A Promotion may be announced via CPH’s Websites or other means at CPH’s sole discretion (“Promotion Announcement”). The Promotion Announcement will include at least the following for that individual specific Promotion: (1) the start and end date; (2) any additional eligibility requirements; (3) method of entry; (4) description of how many, the nature and estimated value of each prize; and (5) description of how and when a potential winner(s) will be selected and notified. 2. Agreement to Rules. Any Entrant who does not agree with these terms and conditions should not enter into a Promotion. Participation in a Promotion constitutes Entrant’s full and unconditional agreement to and acceptance of these Official Promotion Rules, including amendments and rules contained in a Promotion Announcement, and the decisions of CPH, which are final, binding and non-appealable in all respects. 3. No Purchase Necessary. No purchase or fee is necessary to enter into any Promotion. A Purchase will not improve chances of winning. Odds of winning a Giveaway depend entirely on the number of eligible entries received. 4. Entrant Eligibility. Unless otherwise stated or posted in the Promotion Announcement, Entrant must be a resident with a shipping address (not a P.O. Box) in the United States. Entrant must be 18 years of age or older. Employees and trustees of CPH or any of its agencies, and members of the immediate families (defined as including parents, spouse, children, siblings, grandparents, and each of their respective spouses) or households (whether related or not) of any of the above, are NOT eligible to participate in the Contest. If an Entrant changes his or her contact information, it is the Entrant’s responsibility to notify CPH of the updated information. 5. Subject to Laws. A Promotion is subject to all applicable federal, state and local laws and regulations. The following Promotions are void: (1) any Promotion in the state of Arizona, (2) any Promotion in the state of Rhode Island when the estimated value of the Prize is greater than $500 USD, (3) any Promotion in the states of Florida or New York when the estimated value of the Prize is greater than $5000 USD, and (4) any Promotion in jurisdictions where registration may be required. Promotion is void where prohibited by law. 6. Email Account. Entrant is deemed to be the holder of the established email account associated with the entry. Only one entry per person, e-mail address or per household will be considered for Promotion entry, unless multiple entries are specifically allowed in the Promotion Announcement. 7. Entry Eligibility. Entries received after the deadline set forth in the Promotion Announcement are ineligible, null, and void. CPH will not be responsible for and will not consider incomplete or incorrect entries. CPH is not responsible for entries that are sent but not received by CPH or are unable to be processed for any reason. CPH reserves the right to void all entries made through any robotic, automatic, mechanical, programmed, or similar entry duplication method, and all entries that have been tampered with or altered, mass entries, photocopies or reproductions. Entries that contain errors or are incomplete will not be accepted. If, in CPH’s opinion, there is any suspected or actual evidence of electronic or non-electronic tampering with any portion of the Promotion, or if computer viruses, bugs, unauthorized intervention, fraud, technical difficulties or failures compromise, corrupt or affect the administration, integrity, security, or fairness of the Promotion, CPH at its sole discretion reserves the right to disqualify any individual involved in such activity and to modify or suspend the Promotion, or to terminate the Promotion and conduct a random drawing to award the Promotion Prize using all Eligible Entries received as of the termination date/time. Should the Promotion be terminated prior to the stated end date, notice of such termination will be posted on the Promotion web site, and CPH may proceed to select a winner from among all Eligible Entries received as of the termination date. Any attempt by an Entrant or any other individual to deliberately damage the web site or otherwise undermine the legitimate operation of the Promotion is unlawful; and, should such an attempt be made, CPH reserves the right to seek damages and other remedies from any such person to the fullest extent permitted by law. FAILURE BY THE WINNER TO COMPLY WITH THESE OFFICIAL RULES IN ANY WAY, AS DETERMINED BY CPH, WILL RESULT IN DISQUALIFICATION AND FORFEITURE OF ALL RIGHTS IN AND TO THE PRIZE. 8. Entries. Any design, comment or other required information for entry in a Promotion must be an original to the entrant and may not violate any U. S. copyright law. 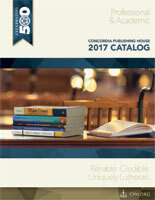 All entries become the property of Concordia Publishing House and will not be returned. 9. Winner Selection in Giveaways. In a Giveaway Promotion in which the potential winner(s) is selected at random, CPH (or its designee) will conduct a random drawing from among all eligible entries contained in the Promotion entry pool. 10. Winner Selection in Contests. In a Contest Promotion in which the potential winner(s) is selected based upon skill or accomplishments, CPH (or its designee) will choose the potential winner(s) based on the merits of each entry, in CPH’s sole and absolute discretion, according to the requirements of the Promotion Announcement. 11. Winner Notification. The potential winner(s) of the Promotion will be notified via e-mail, phone or mail. CPH (or its designee) will exercise reasonable effort to notify and award the Prize to the potential winner(s) selected. However, unless otherwise stated in the Promotion Announcement, a potential winner may be required (in CPH’s sole and absolute discretion) to forfeit any and all rights to receive the Prize if one or more of the following occurs: (1) if a potential winner fails to respond to the notification within fourteen (14) days, (2) if a potential winner declines to accept the Prize, (3) if the notification or the Prize itself is returned as undeliverable, or (4) if the potential winner(s) does not satisfy all of the eligibility requirements. If a potential winner is required to forfeit rights to receive the Prize, CPH may elect (but shall not be required) to select an alternate potential winner in CPH’s sole and absolute discretion, and CPH shall be fully and completely released and discharged from any liability or responsibility in this regard. 12. Affidavit and Release. CPH reserves the right to require the potential winner(s) to execute an Affidavit of Eligibility and/or a Publicity/Liability Release as sworn documents and to provide other proof of eligibility as a condition of receipt of the Prize within fourteen (14) days or an alternate winner shall be selected. 13. Prize Considerations. Any difference between the actual value of the Prize and the estimated value included in the Promotion Announcement will not be awarded. If the specified prize becomes unavailable for any reason, CPH in its sole and absolute discretion may substitute a Prize of like, equal or greater value. The winner(s) may not transfer prize rights nor request substitutions or cash redemptions. The actual Prize recipient acknowledges, agrees and understands that he or she shall bear sole responsibility for any incidental expenses not specified in the prize description and for the reporting and prompt and full payment of any and all applicable federal, state and local taxes, as well as any duties, fees, excises or tariffs, if any, now or hereafter imposed, that are not specifically awarded herein as part of the Prize, may be owed in connection with the receipt, possession or use of the Prize. WINNER WILL BE ISSUED AN IRS FORM 1099 (ALSO SUBMITTED TO THE UNITED STATES INTERNAL REVENUE SERVICE) FOR THE VALUE OF ANY PRIZE THAT EXCEEDS $600 IN VALUE. No more than the stated number of Prizes will be awarded. 14. Publicity. Except where prohibited by law, by submitting an entry into a Promotion, Entrant agrees to allow CPH to use Entrant’s name, city and state or providence, comments, voice and/or images in connection with publication of Entrant’s entry and for promotional purposes, without review, notification, approval, or compensation. Entrant hereby grants to CPH an irrevocable, perpetual and royalty-free right to use, reproduce, edit, display, transmit, prepare derivative works of, modify, publish and otherwise make use of any comments or submitted photo or other information in any and all media, whether now known or hereinafter created, throughout the world and for any purpose deemed reasonable by CPH. In addition to other things, the rights granted to CPH include but are not limited to the right to resize, crop, censor, compress, edit, feature, caption, affix logos to, and to otherwise alter or make use of any comments or submitted photo. 15. Limitations of Responsibility. By entering the Promotion, each Entrant agrees and acknowledges, except where prohibited, (a) to waive any rights to claim ambiguity with these Official Promotion Rules; (b) that CPH shall have no responsibility or liability (including, but not limited to, liability for any property loss, damage, damage, expense, personal injury or death) in connection with or arising from: (1) Entrant’s participation in Promotion; (2) acceptance, possession, receipt or late receipt (including, but not limited to, delays by shipping companies), defects, and/or use/misuse of any prize or any portion of any prize or participation in any prize related activities, including but not limited to travel associated therewith, or CPH’s use of the A/V Materials submitted to CPH; (3) electronic or human error in the processing of Entries or the selection of winners; (4) incorrect or inaccurate transcription of registration information; (5) any technical malfunctions, viruses, bugs, non-authorized interventions, disruptions, deletions, interruptions, failures, omissions or defects of the telephone, mail, email, software, computer systems, equipment, networks or service providers utilized by the CPH; (6) Entrant’s inability to access the website of any CPH entity; (7) any lost, delayed, late, misdirected, illegible, incomplete or postage due mail or email transmissions, omissions, interruptions, and defects; (8) any other errors or malfunctions, even if caused by the negligence of CPH Entities, (9) the negligence of any other party, including Entrant; (10) CPH will endeavor to remove disqualifying entries from the drawing pool, but it cannot guarantee that all disqualified entries will, in fact, be removed, and/or (11) any injury or damage to persons or property, including but not limited to Entrant’s computer, which may be caused, directly or indirectly, in whole or in part, from Entrant’s participation in the Promotion, receipt or use or misuses of any prize, or from downloading any material from CPH’s Websites, regardless of whether the material was prepared by CPH or a third party, and regardless of whether the material is connected to CPH’s Websites by a hypertext link; (c) CPH makes no guarantees, warranties, or representations of any kind, express or implied in fact or in law, with respect to the Prize, except as stated in these Official Promotion Rules; and (d) additional restrictions, imposed by any applicable venue, may limit use of the Prize. 16. Termination of Promotion. CPH reserves the right in its sole and absolute discretion to terminate any Promotion at any time without prior notice, including but not limited to if it becomes technically corrupted or because of unauthorized human intervention. CPH reserves the right in the event of such cancellation to award the Prize to an eligible, non-suspect entry received prior to cancellation. 17. Release. By submitting the entry, Entrant agrees, except where prohibited, and hereby releases and holds CPH, Coordinators, advertising and promotion agencies and prize suppliers and their respective officers, directors, members, trustees, insurers, agents, employees and shareholders (the “Released Parties”) harmless from and against any and all rights, claims, causes of action and liability whatsoever, including but not limited to any injury, loss, damage, whether direct, compensatory, incidental or consequential, to person, including but not limited to invasion of privacy, defamation, portrayal in a false light or death, and/or property, resulting or arising from, in whole or in part, directly or indirectly, the Promotion, and/or Entrant’s entry and/or participation in the Promotion and/or acceptance, possession, use, non-use or misuse of the Prize and/or CPH’s use of the comments or other materials submitted to CPH in any manner in CPH’s sole and absolute discretion. Entrant further agrees to release all rights to bring any claim, action or proceeding against any of the Released Parties. Entrant hereby also acknowledges CPH has neither made nor is in any manner responsible or liable for any warranty, representation or guarantee, express or implied, in fact or in law, relative to a prize, including express warranties provided exclusively by a prize supplier that may accompany a prize. CPH shall not be liable for any injury, damage, loss, expense, accident, delay, inconvenience or irregularity that may be caused or contributed to (1) by any wrongful, negligent or unauthorized act or omission on the part of any of the prize suppliers or any of their agents, servants, employees or independent contractors, (2) by any wrongful, negligent or unauthorized act or omission on the part of any other person or entity not an employee of CPH, or (3) by any other cause, condition or event whatsoever beyond the control of CPH. The Title of this Promotion may change during the Entry Period. ENTRANT ALSO FURTHER ACKNOWLEDGES THAT CPH AND ITS AFFILIATED PROMOTIONAL AND ADVERTISING AGENCIES HAVE NEITHER MADE, NOR ARE IN ANY MANNER RESPONSIBLE OR LIABLE FOR, ANY WARRANTY, REPRESENTATION OR GUARANTEE, EXPRESSED OR IMPLIED, IN FACT OR IN LAW, RELATIVE TO ANY PRIZE OR THE PROMOTION. 18. Dispute Resolution. Except where prohibited, Entrant agrees that: (1) any and all disputes, claims and causes of action arising out of or connected with this Promotion or any prize awarded shall be resolved individually, without resort to any form of class action, and exclusively by non-administered mediation or, if necessary, binding arbitration conducted in accordance with the rules of the Institute for Christian Conciliation™ a division of PeaceMaker Ministries (ICC) in Nashville, Tennessee; (2) any and all claims, judgments and awards shall be limited to actual out-of-pocket costs incurred, including costs associated with entering this Promotion, but shall not, in any event, include attorneys’ fees; and (3) under no circumstances will Entrant be permitted to obtain awards for, and Entrant hereby waives all rights to claim, indirect, punitive, incidental and consequential damages and any other damages, other than for actual out-of-pocket expenses, and Entrant further waives any and all rights to have damages multiplied or otherwise increased. All issues and questions concerning the construction, validity, interpretation and enforceability of these Official Promotion Rules, or the rights and obligations of the Entrant and CPH in connection with the Promotion, shall be governed by, and construed in accordance with, the laws of the State of Missouri, without giving effect to any choice of law or conflict of law rules (whether of the State of Missouri or any other jurisdiction), which would cause the application of the laws of any jurisdiction other than the State of Missouri. All mediation and arbitration proceedings shall be conducted in St. Louis, Missouri. Judgment upon an arbitration decision may be entered in any state court located in St. Louis, Missouri.The invalidity or unenforceability of any provision of these rules shall not affect the validity or enforceability of any other provision. In the event that any such provision is determined to be invalid or otherwise unenforceable, these rules shall be construed in accordance with their terms as if the invalid or unenforceable provision was not contained therein. CPH and Entrant agree that these methods shall be the sole remedy for any controversy or claim arising out of their relationship or this agreement and expressly waive their right to file a lawsuit against one another in any civil court for such disputes, except to enforce a legally binding arbitration decision. 19. Invalidity of a Provision. If any of the terms or conditions of these Official Promotion Rules shall be deemed invalid, void, or for any reason unenforceable, that term or condition shall be deemed severable and shall not affect the validity and enforceability of any remaining term, rule, or condition. CPH’s failure to enforce any term of these Official Rules for any reason shall not constitute a waiver of that provision. 21. No Affiliation or Endorsement by Prize Manufacturers or Producers. The product names used in this Promotion are for identification purposes only. All trademarks and registered trademarks are the property of their respective owners. Unless CPH is the Prize manufacturer or producer, the Prize manufacturers or producers and their subsidiaries and affiliated companies, are not endorsing, sponsoring, or otherwise affiliated with this Promotion in any manner. 22. Promotions involving Facebook, Twitter, LinkedIn or Other Social Media Enterprise. If this Promotion is used in connection with any Facebook, Twitter, LinkedIn or other related “Social Media Enterprise” page of CPH, Entrant acknowledges and agrees that this Promotion is in no way sponsored, endorsed or administered by, or associated with such Social Media Enterprise. Entrants are providing information to CPH and not to such Social Media Enterprise. The applicable Social Media Enterprise, including its directors, officers, employees, agents, insurers and affiliates are hereby included as Released Parties. 24. Removal from Mailing List. If any person has received an advertisement for this Promotion in the mail, such person has a right to have his or her name removed from CPH’s Promotion mailing list. Requests to be removed from the Promotion mailing lists can be mailed to the Promotion Coordinator. CPH has sixty (60) days to process such requests after receipt. 25. Winners List. A list of winners will be maintained at the offices of CPH for 4 years after the conclusion of the Entry Period and the award of prizes applicable to the Promotion won by each winner. Copies of the list are available upon written request to the Promotion Coordinator, along with a self-addressed postage prepaid (residents of VT need not prepay postage) envelope addressed to you, mailed to the address at which entries are submitted as indicated above. Requests must be submitted not more than sixty (60) days following the date of the drawing.